The spread of ebola and other infectious diseases could be tracked – and victims of the diseases could more quickly find help – with a new app for Android phones being developed by University of Rochester researchers. A National Science Foundation (NSF) grant will allow the researchers to conduct a pilot study this summer in Lagos, Nigeria using the app to complement traditional forms of monitoring and to support the work of doctors and other health workers in the region. The app, called Node, monitors location patterns (e.g. where people are and where they go), habits (e.g. walking, sleeping), and resource needs (e.g. hand sanitizers or gloves) to help people find care, improve the monitoring of disease, and increase awareness of disease prevention. While this Ebola epidemic is waning, the researchers hope the app may be useful in response to future epidemics, of Ebola or other diseases. Solomon Abiola, during a trip to Ghana. Courtesy of Solomon Abiola. The app is the brainchild of Solomon Abiola, a research associate at the University of Rochester Medical Center, who came up with the idea during his undergraduate studies at Princeton University as a way of monitoring meningitis amongst students. “I was in Nigeria when they declared their first Ebola case and I thought that this app could have some potential for monitoring the spread of the disease,” said Abiola. When the Centers for Disease Control and Prevention and the NSF announced a call for proposals in relation to the modeling and understanding of the spread of Ebola, he mentioned his app to his soon-to-be boss at the University of Rochester, Ray Dorsey, director of Rochester’s Center for Human Experimental Therapeutics. Together with Henry Kautz, the Robin and Tim Wentworth Director of Rochester’s Goergen Institute of Data Science, they put together a proposal to establish the feasibility of using Node to track a disease like Ebola. 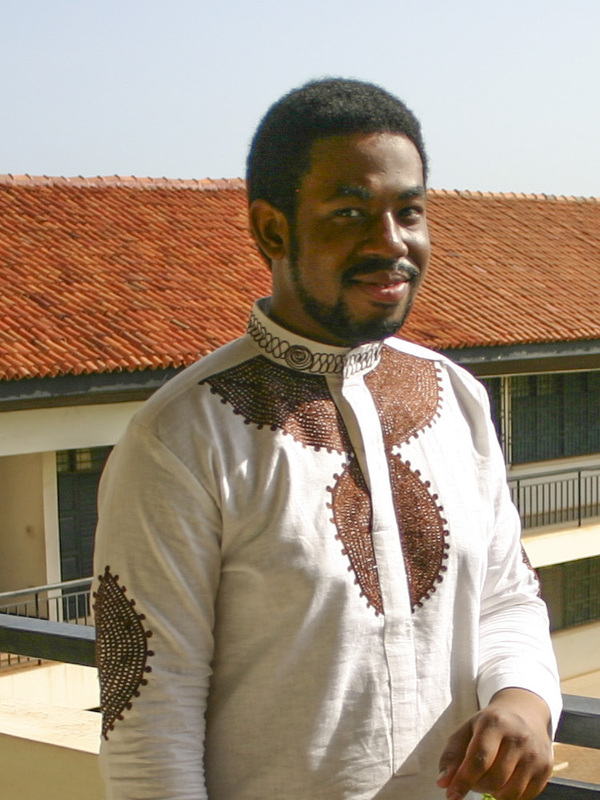 Abiola is keen to stress that the potential for the low-cost app goes beyond Ebola; it could help with other infectious diseases such as malaria and tuberculosis. He explains that this epidemic offers a chance to learn for the future. “We now need to figure out how useful the app would be and work with people in the community to see how they would use it,” explains Abiola. He has been setting up contacts with universities and medical centers in Nigeria with the hope of doing a pilot study with over 100 people. The researchers have also been making some changes to the app for more active monitoring. How effective are smartphones at predicting the spread of a disease (Ebola in this case) compared to more traditional epidemiology models? 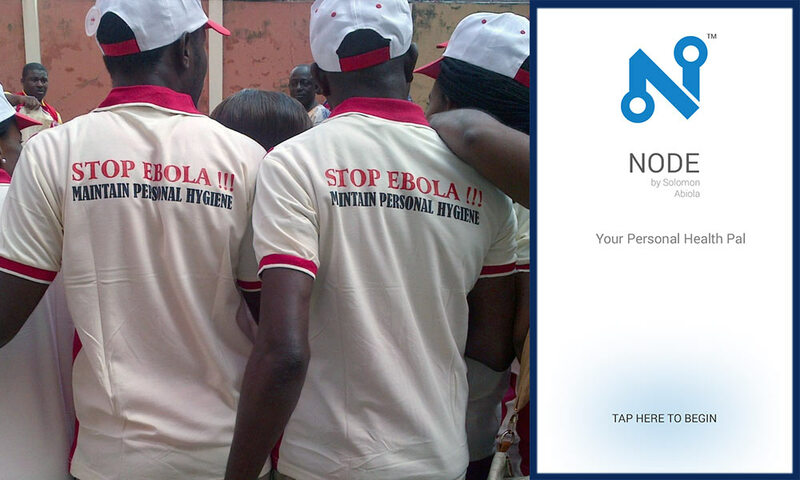 Several other high-tech initiatives already use mobile phones as part of the monitoring and prevention of Ebola. For example, the CDC is monitoring cell phone towers that route calls to emergency call centers to help predict how Ebola is spreading. IBM also set up a system to collect mobile phone messages from patients, doctors and others. However, Node does not rely on a call or message actually being placed in order to obtain a location for the user. Its GPS/WiFi tracking allows Node to link data to individual villages, while the CDC approach can only link data to cell towers that may serve multiple villages. Node could allow for better allocation of resources and a more accurate location of contacts. Can Node provide information on prevention of the disease, and can this change people’s behaviors? Smartphones are an efficient way of reaching people in a timely manner. For example, the BBC launched a WhatsApp group chat to share audio, text message alerts and images to help people get the latest public health information. Node would also serve to connect with at-risk populations. Is a health program based on mobile phones sustainable in West Africa? Cell phone usage in West African countries ranges from 40 to 80% and upwards, with over 2 million Android devices in Sierra Leone, Guinea, and Liberia alone. The researchers will look at whether the infrastructure can support such innovations over the long term. 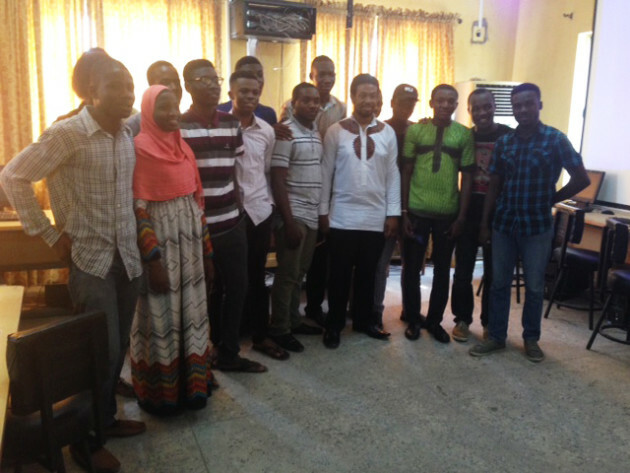 Abiola stands with students at the University of Lagos, Nigeria, who are testing the application, following a presentation on his work in the region. Many groups are researching the use of mobile phones and other high-tech approaches to monitor the spread of disease. For example, in the U.S. the CDC already uses Google trends to better understand the spread of the flu each season. Abiola has recently returned from Nigeria where he planned the roll-out of the pilot study and met with potential collaborators, including Professor Oyewale Tomori, president of the Nigerian Academy of Sciences and Professor Olaoluwa Akinwale, director of research at the Nigerian Institute of Medical Research. He also held a seminar with students at the University of Lagos, who are currently aiding in the initial testing of the application. He says he is excited that what started as an undergraduate student project could end up being a building block in public health monitoring, and looks forward to further developing it during his joint-Ph.D. in Translational Biomedical Sciences and Computer Science at the University of Rochester.